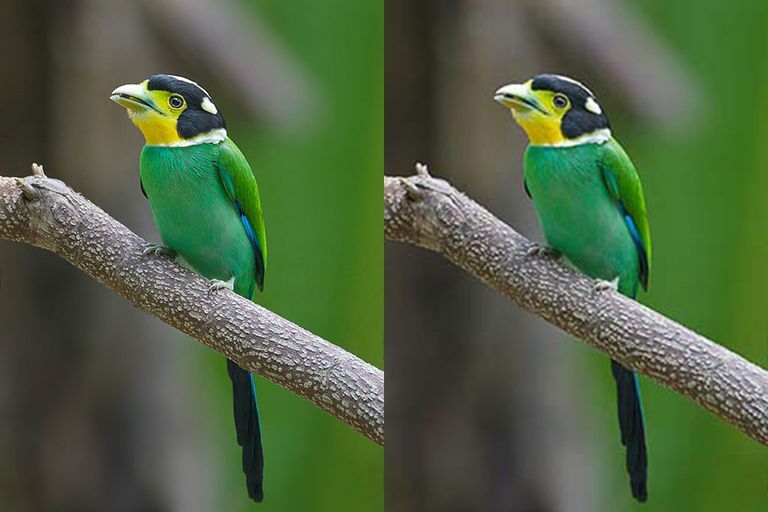 Sample of Loss of Detail Due to JPEG compression. When video, photo or music is saved in a digital format the result can be a huge file that is hard to stream and uses up a lot of memory on the computer or hard drive to which it is saved. Therefore, files are compressed, or made smaller, by removing some of the data. This is called a "lossy" compression. Usually, a complex calculation (algorithm) is used so that the effects of the lost data is imperceptible to the eye in video and photos, or can't be heard in music. Some of the visual data that is lost takes advantage of the human eye's inability to make out small differences in color. In other words, with good compression technology, you shouldn't be able to perceive a loss of picture or sound quality. But, if a file must be compressed to make it much smaller than its original format, the result may not only be perceptible but can actually make the picture quality so bad that the video is unwatchable or the music is flat and lifeless. A high definition movie can take up a lot of memory, sometimes more than four gigabytes. If you want to play that movie on a smartphone, you will need to make it a much smaller file or it would take up all of the phone's memory. The loss of data from high compression is not noticeable on the four-inch screen. But, if you want to stream that file to an Apple TV, Roku Box, or similar device, that is connected to a large screen TV, the compression will become not only obvious, but it will make the video look terrible and be hard to watch. Colors may look blocky, not smooth. Edges may be blurred and jagged. Movements may blur or stutter. This is the problem with using AirPlay from an iPhone or iPad. AirPlay is not simply streaming from the source. Instead, it is streaming the playback onto the phone. Initial efforts at AirPlay have often been victim to the effects of high video compression. While you must consider the size of the file, you must also balance it with maintaining the quality of the music, photos or video. Your hard drive or media server's space may be limited, but external hard drives are coming down in price for larger capacities. The choice may be quantity vs. quality. You can get thousands of compressed files on a 500 GB hard drive, but you may prefer to have only hundreds of high-quality files. You can usually set the preferences for how much an imported or saved file is compressed. There are often settings in music programs like iTunes that allow you to set the compression rate for songs that you import. Music purists recommend the highest so you don't lose any of the subtleties of the songs, 256 kbps for stereo at a minimum, HiRes audio formats to allow much higher bit rates. Photo jpeg settings should be set for maximum size to maintain picture quality. High definition movies should be streamed in their originally saved digital format like h.264, or MPEG-4. The goal of compression is to get the smallest file without the loss of picture and/or sound data being noticeable. You can't go wrong with bigger files and less compression unless you run out of space.